As the spring season comes in and the weather continues to get nicer, now is the time to assess the winter damage in your home and make plans for home improvement. Because DIY projects are both fun and challenging, even those who don’t have enough skills and background on home repair choose to do the work themselves, with a little guide from how-to articles and videos online. So, if you’re thinking about repairing your roof, repainting your home, installing new cabinets, or fixing your plumbing, the following safety tips can lower your chances of getting injured. Even simple electrical repairs such as installing switches and lighting fixtures can pose fire hazards. Even professional electricians do encounter serious accidents. Make sure to keep a working fire extinguisher at bay. It will save you from being fatally injured and your valued possessions from potentially turning into ashes. Wood clamps are valuable tools in the workshop. They serve as your extra set of hands for your project. Without them, woodworking is much messier and could lead to serious injuries. There are various types of wood clamps. Choose the right clamp for your woodworking project. If you have low vision, make sure that your work-space is well-lit. If you can take the work outside where there’s sufficient natural light, much better. But if you’re working on something inside the house, consider using a moveable lamp with adjustable flex-arm. It’s very helpful because you can adjust the direction of the light as needed. No matter how careful you are, accidents can still happen. Why? Because they’re accidents. Cuts, abrasions and minor injuries are inevitable sometimes when doing home repairs. A basic first aid kit is crucial to any home or workshop. Whether you’re painting, installing a crown molding, or taking down a wall, one of the first steps you need to do is secure the floor. You can do that using tarps. They are sturdier than paper and more cost-effective than plywood. Tarps give you the protection you need and make cleanup easier. Safety gears, such as goggles, gloves and helmet are crucial to any home repair project – whether you are drilling holes on a concrete surface or cutting tiles and metals, small particles like fine dust and flying debris, as well as flare from a welding machine can cause severe eye damage. If you’re repairing a roof and similar jobs, make sure you’re wearing a helmet. Gloves are basic protective tool which you should wear all the time. It may be tempting to work in flip-flops on a warm and sunny day but you may run the risk of hurting yourself. Wear tight-fitting clothing and boots, and take off any accessory or jewelry as they might be snagged on sharp objects or moving parts. Proper ventilation while painting a room does not only speed up the drying process, it also protects you from inhaling toxic chemicals that could cause a respiratory problem or an allergic reaction. Wear a mask too and don’t let your kids or pets enter the room until after several hours or at least, overnight. It may seem like an added chore but it definitely pays to take time reading instructional manuals. Whether you’re installing a new appliance or cabinet, check the product manual to ensure that you’re doing it right and safely. Never allow your kids or pets near your working area, especially when you’re using power tools. They could meddle with your home project and distract you, and they can get injured too. Hundreds of people are brought to the ER each year because of DIY-related injuries. All it takes is a split second for an accident to happen. 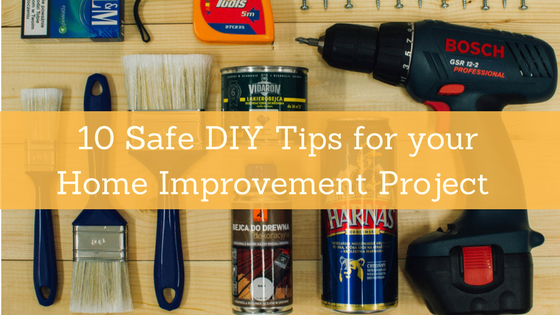 So before you pick up your tools and start your home improvement, follow these 10 safety tips to ensure that your DIY project is a painless success!